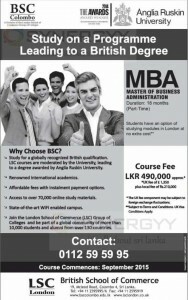 British School of Commerce invites application for MBA (Master of Business Administration) affiliated by Anglia Ruskin University. This MBA Degree programme is part time course schedule for 18 months with an affordable course fee of Rs. 490,000/- all inclusive of GBP 1,350 and Local fee of Rs. 210,000/-.